Fantasy Fortune Teller — interactive storytelling project. Co-Creator — concept creation, writer, designer and co-builder. Fantasy Fortune Teller Box – NYU ITP Project 2015 from Jamie Ruddy on Vimeo. My Physical Computing midterm partner, Phil Guo told me he wanted our project to be freestanding – not connected to a screen – but left it up to me to come up with the concept. I had been building projects all semester, but had yet to try to tie one with storytelling. This was my chance. Most fortune tellers reveal predictions vague enough to pass for the truth. It made me wonder. How entertaining would it be to do the opposite? What if I gave the most detailed, specific and outrageous fortunes imaginable? And the Fantasy Fortune Teller Box was born. We built every piece from the ground up. We carved the wood, designed and laser cut the interface and wrote all of the fortunes, in addition to doing the programming and circuitry. This was my first attempt at true product design and it was an amazing experience. When I think about fortune tellers, the iconic film directed by Penny Marshall immediately comes to mind. There was something so magical about the 80’s era arcade fortune teller. Somehow the fact that the delivery was from a mechanical box made it seem magical – that and the fact that it worked in the film! The Magic Eight Ball is such a simple concept. The ball only has limited answers when you flip it over and yet it is the most addictive, entertaining fortune teller product I can remember. 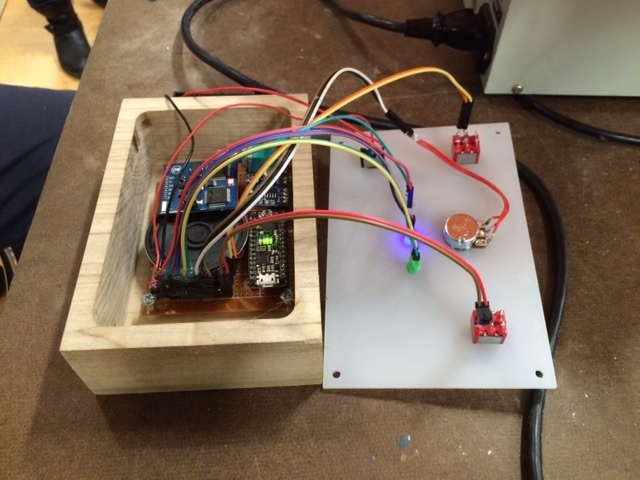 The Fortune Teller Box runs off of an Arduino with a speech to text chip and is powered by a nine volt battery. We programmed the Arduino to choose a random answer limited to the category chosen by the user: wealth, health or love. There are 60 fortunes programmed as of now, but more could be added. We built a small amplifier and a speaker into the box, but it is rather quiet. At first I believed this was a design flaw, but in a strange way it makes the experience of hearing the fortune a little more intimate because most users choose to hold the box up to their ear.